Immanuel Velikovsky (/ˌvɛliˈkɒfski/; Russian: Иммануи́л Велико́вский, IPA: [ɪmənʊˈil vʲɪlʲɪˈkofskʲɪj]; 10 June [O.S. 29 May] 1895 – 17 November 1979) was a Russian independent scholar who wrote a number of books reinterpreting the events of ancient history, in particular the US bestseller Worlds in Collision published in 1950. Earlier, he had played a role in the founding of the Hebrew University of Jerusalem in Israel, and was a psychiatrist and psychoanalyst. Velikovsky's work is frequently cited as a canonical example of pseudoscience and has been used as an example of the demarcation problem. His books use comparative mythology and ancient literary sources (including the Old Testament) to argue that Earth suffered catastrophic close contacts with other planets (principally Venus and Mars) in ancient history. In positioning Velikovsky among catastrophists including Hans Bellamy, Ignatius Donnelly, and Johann Gottlieb Radlof, the British astronomers Victor Clube and Bill Napier noted "... Velikovsky is not so much the first of the new catastrophists ...; he is the last in a line of traditional catastrophists going back to mediaeval times and probably earlier." Velikovsky argued that electromagnetic effects play an important role in celestial mechanics. He also proposed a revised chronology for ancient Egypt, Greece, Israel, and other cultures of the ancient Near East. The revised chronology aimed at explaining the so-called "dark age" of the eastern Mediterranean (c. 1100–750 BC) and reconciling biblical history with mainstream archaeology and Egyptian chronology. In general, Velikovsky's theories have been ignored or vigorously rejected by the academic community. Nonetheless, his books often sold well and gained an enthusiastic support in lay circles, often fuelled by claims of unfair treatment for Velikovsky by orthodox academia. The controversy surrounding his work and its reception is often referred to as "the Velikovsky affair". Immanuel Velikovsky was born in 1895 to a prosperous Jewish family in Vitebsk, Russia (now in Belarus). The son of Shimon (Simon Yehiel) Velikovsky (1859–1937) and Beila Grodensky, he learned several languages as a child and was sent away to study at the Medvednikov Gymnasium in Moscow, where he performed well in Russian and mathematics. He graduated with a gold medal in 1913. Velikovsky then traveled in Europe and visited Palestine before briefly studying medicine at Montpellier in France and taking premedical courses at the University of Edinburgh. He returned to Russia before the outbreak of World War I, enrolled in the University of Moscow, and received a medical degree in 1921. Upon taking his medical degree, Velikovsky left Russia for Berlin. With the financial support of his father, Velikovsky edited and published two volumes of scientific papers translated into Hebrew. The volumes were titled Scripta Universitatis Atque Bibliothecae Hierosolymitanarum ("Writings of the Jerusalem University & Library"). He enlisted Albert Einstein to prepare the volume dealing with mathematics and physics. This project was a cornerstone in the formation of the Hebrew University of Jerusalem, as the fledgling university was able to donate copies of the Scripta to the libraries of other academic institutions in exchange for complimentary copies of publications from those institutions. In 1923, Velikovsky married Elisheva Kramer, a young violinist. Velikovsky lived in what was then the British Mandate of Palestine from 1924 to 1939, practising medicine in the fields of general practice, psychiatry, and psychoanalysis which he had studied under Sigmund Freud's pupil Wilhelm Stekel in Vienna. During this time, he had about a dozen papers published in medical and psychoanalytic journals. He was also published in Freud's Imago, including a precocious analysis of Freud's own dreams. In 1939, with the prospect of war looming, Velikovsky travelled with his family to New York City, intending to spend a sabbatical year researching for his book Oedipus and Akhenaton. The book was inspired by Freud's Moses and Monotheism and explored the possibility that Pharaoh Akhenaton was the legendary Oedipus. Freud had argued that Akhenaton, the supposedly monotheistic Egyptian pharaoh, was the source of the religious principles that Moses taught to the people of Israel in the desert. Freud's claim (and that of others before him) was based in part on the resemblance of Psalm 104 in the Bible to the Great Hymn to the Aten, an Egyptian hymn discovered on the wall of the tomb of Akhenaten's courtier, Ay, in Akhenaten's city of Akhetaten. To disprove Freud's claim and to prove the Exodus as such, Velikovsky sought evidence for the Exodus in Egyptian documents. One such document was the Ipuwer Papyrus, which he felt reported events similar to several of the Biblical plagues. Since conventional Egyptology dated the Ipuwer Papyrus much earlier than either the Biblical date for the Exodus (ca. 1500—1450 BCE) or the Exodus date accepted by many of those who accepted the conventional chronology of Egypt (ca. 1250 BCE), Velikovsky had to revise the conventional chronology. Dr. Immanuel Velikovsky 1947 passport photo. Within weeks of his arrival in the United States, World War II began. Launching on a tangent from his original book project, Velikovsky began to develop the radical catastrophist cosmology and revised chronology theories for which he would become notorious. For the remainder of the Second World War, now as a permanent resident of New York City, he continued to research and write about his ideas, searching for a means to disseminate them to academia and the public. He privately published two small Scripta Academica pamphlets summarising his theories in 1945 (Theses for the Reconstruction of Ancient History and Cosmos Without Gravitation). He mailed copies of the latter to academic libraries and scientists, including Harvard astronomer Harlow Shapley in 1947. In 1950, after eight publishing houses rejected the Worlds in Collision manuscript, it was finally published by Macmillan, which had a large presence in the academic textbook market. Even before its appearance, the book was enveloped by furious controversy, when Harper's Magazine published a highly positive feature on it, as did Reader's Digest, with what would today be called a creationist slant. This came to the attention of Shapley, who opposed the publication of the work, having been made familiar with Velikovsky's claims through the pamphlet Velikovsky had given him. Shapley threatened to organise a textbook boycott of Macmillan for its publication of Worlds in Collision, and within two months the book was transferred to Doubleday. It was by then a bestseller in the United States. In 1952, Doubleday published the first installment in Velikovsky's revised chronology, Ages in Chaos, followed by the Earth in Upheaval (a geological volume) in 1955. In November 1952, Velikovsky moved from Manhattan to Princeton, New Jersey. For most of the 1950s and early 1960s, Velikovsky was persona non grata on college and university campuses. After this period, he began to receive more requests to speak. He lectured, frequently to record crowds, at universities across North America. In 1972, the Canadian Broadcasting Corporation aired a one-hour television special featuring Velikovsky and his work, and this was followed by a thirty-minute documentary by the BBC in 1973. During the remainder of the 1970s, Velikovsky devoted a great deal of his time and energy to rebutting his critics in academia, and he continued to tour North America and Europe to deliver lectures on his ideas. By that time, the elderly Velikovsky suffered from diabetes and intermittent depression, which his daughter said may have been exacerbated by the academic establishment's continuing rejection of his work. [third-party source needed] He died in 1979. For many years, Velikovsky's estate was controlled by his two daughters, Shulamit Velikovsky Kogan (b. 1925), and Ruth Ruhama Velikovsky Sharon (b. 1926), who generally resisted the publication of any further material. (Exceptions include the biography ABA — the Glory and the Torment: The Life of Dr. Immanuel Velikovsky, issued in 1995 and greeted with rather dubious reviews; and a Hebrew translation of another Ages in Chaos volume, The Dark Age of Greece, which was published in Israel.) A volume of Velikovsky's discussions and correspondence with Albert Einstein appeared in Hebrew in Israel, translated and edited by his daughter Shulamit Velikovsky Kogan. In the late 1990s, a large portion of Velikovsky's unpublished book manuscripts, essays and correspondence became available at the Velikovsky Archive website. In 2005, Velikovsky's daughter Ruth Sharon presented his entire archive to Princeton University Library. Notwithstanding Velikovsky's dozen or so publications in medical and psychoanalytic journals in the 1920s and 1930s, the work for which he became well known was developed by him during the early 1940s, whilst living in New York City. He summarised his core ideas in an affidavit in November 1942, and in two privately published Scripta Academica pamphlets entitled Theses for the Reconstruction of Ancient History (1945) and Cosmos without Gravitation (1946). Rather than have his ideas dismissed wholesale because of potential flaws in any one area, Velikovsky then chose to publish them as a series of book volumes, aimed at a lay audience, dealing separately with his proposals on ancient history, and with areas more relevant to the physical sciences. Velikovsky was a passionate Zionist, and this did steer the focus of his work, although its scope was considerably more far-reaching than this. The entire body of work could be said to stem from an attempt to solve the following problem: that to Velikovsky there appeared to be insufficient correlation in the written or archaeological records between Biblical history and what was known of the history of the area, in particular, Egypt. Velikovsky searched for common mention of events within literary records, and in the Ipuwer Papyrus he believed he had found a contemporary Egyptian account of the Plagues of Egypt. Moreover, he interpreted both accounts as descriptions of a great natural catastrophe. Velikovsky attempted to investigate the physical cause of these events, and extrapolated backwards and forwards in history from this point, cross-comparing written and mythical records from cultures on every inhabited continent, using them to attempt synchronisms of the historical records, yielding what he believed to be further periodic natural catastrophes that can be global in scale. Planet Earth has suffered natural catastrophes on a global scale, both before and during humankind's recorded history. There is evidence for these catastrophes in the geological record (here Velikovsky was advocating Catastrophist ideas as opposed to the prevailing Uniformitarian notions) and archeological record. The extinction of many species had occurred catastrophically, not by gradual Darwinian means. The catastrophes that occurred within the memory of humankind are recorded in the myths, legends and written history of all ancient cultures and civilisations. Velikovsky pointed to alleged concordances in the accounts of many cultures, and proposed that they referred to the same real events. For instance, the memory of a flood is recorded in the Hebrew Bible, in the Greek legend of Deucalion, and in the Manu legend of India. Velikovsky put forward the psychoanalytic idea of "Cultural Amnesia" as a mechanism whereby these literal records came to be regarded as mere myths and legends. The causes of these natural catastrophes were close encounters between the Earth and other bodies within the solar system — not least what are now the planets Saturn, Jupiter, Venus, and Mars, these bodies having moved upon different orbits within human memory. To explain the fact that these changes to the configuration of the solar system violate several well-understood laws of physics, Velikovsky invented a role for electromagnetic forces in counteracting gravity and orbital mechanics. A tentative suggestion that Earth had once been a satellite of a "proto-Saturn" body, before its current solar orbit. That the Deluge (Noah's Flood) had been caused by proto-Saturn's entering a nova state, and ejecting much of its mass into space. A suggestion that the planet Mercury was involved in the Tower of Babel catastrophe. Jupiter had been the prime mover in the catastrophe that saw the destruction of Sodom and Gomorrah. Periodic close contacts with a "cometary Venus" (which had been ejected from Jupiter) had caused the Exodus events (c. 1500 BCE) and Joshua's subsequent "sun standing still" (Joshua 10:12–13) incident. Periodic close contacts with Mars had caused havoc in the 8th and 7th centuries BCE. Earth in Upheaval (1955) dealt with geological evidence for global natural catastrophes. Velikovsky's ideas on his earlier Saturn/Mercury/Jupiter events were never published, and the available archived manuscripts are much less developed. Of all the strands of his work, Velikovsky published least on his belief that electromagnetism plays a role in orbital mechanics. Although he appears to have retreated from the propositions in his 1946 monograph Cosmos without Gravitation, no such retreat is apparent in Stargazers and Gravediggers. Cosmos without Gravitation, which Velikovsky placed in university libraries and sent to scientists, is a probable catalyst for the hostile response of astronomers and physicists to his later claims about astronomy. However, other Velikovskian enthusiasts such as Ralph Juergens (dec.), Earl Milton (dec.), Wal Thornhill, and Donald E. Scott have claimed that stars are powered not by internal nuclear fusion, but by galactic-scale electrical discharge currents. Such ideas do not find support in the conventional literature and are rejected as pseudoscience by the scientific community. Velikovsky argued that the conventional chronology of the Near East and classical world, based upon Egyptian Sothic dating and the king lists of Manetho, was wholly flawed. This was the reason for the apparent absence of correlation between the Biblical account and those of neighbouring cultures, and also the cause of the enigmatic "Dark Ages" in Greece and elsewhere. Velikovsky shifted several chronologies and dynasties from the Egyptian Old Kingdom to Ptolemaic times by centuries (a scheme he called the Revised Chronology), placing The Exodus contemporary with the fall of the Middle Kingdom of Egypt. He proposed numerous other synchronisms stretching up to the time of Alexander the Great. He argued that these eliminate phantom "Dark Ages", and vindicate the biblical accounts of history and those recorded by Herodotus. These ideas were first put forward briefly in his Theses for the Reconstruction of Ancient History, but Ages in Chaos was his first full-length work on the subject. This was followed by Oedipus and Akhenaton, Peoples of the Sea and Rameses II and His Time, and two further works that were unpublished at the time of his death but that are now available online at the Velikovsky Archive: The Assyrian Conquest and The Dark Ages of Greece. Though rejected by mainstream historians, these ideas have been developed by other historians such as David Rohl and Peter James, who have also attempted their own revised chronologies. 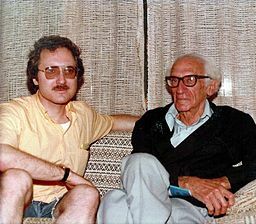 C. Leroy Ellenberger with Immanuel Velikovsky at Seaside Heights, New Jersey, in 1978. Velikovsky inspired numerous followers during the 1960s and 1970s. Alfred de Grazia dedicated a 1963 issue of his journal, American Behavioral Scientist, to Velikovsky, which was published in an expanded version as a book, The Velikovsky Affair — Scientism Versus Science, in 1966. The Skeptical Inquirer, in a review of a later book by de Grazia, Cosmic Heretics (1984), suggests that de Grazia's efforts may be responsible for Velikovsky's continuing notability during the 1970s. The Society for Interdisciplinary Studies (SIS) was "formed in 1974 in response to the growing interest in the works of modern catastrophists, notably the highly controversial Dr. Immanuel Velikovsky". The Institute for the Study of Interdisciplinary Sciences (ISIS) is a 1985 spinoff from the SIS founded under the directorship of David Rohl, who had come to reject Velikovsky's Revised Chronology in favour of his own "New Chronology". Kronos: A Journal of Interdisciplinary Synthesis was founded in 1975 explicitly "to deal with Velikovsky's work". Ten issues of Pensée: Immanuel Velikovsky Reconsidered appeared from 1972 to 1975. The controversy surrounding Velikovsky peaked in the mid 1970s and public interest declined in the 1980s and, by 1984, erstwhile Velikovskyist C. Leroy Ellenberger had become a vocal critic of Velikovskian catastrophism. Some Velikovskyist publications and authors such as David Talbott remain active into the 2000s. Most of Velikovsky's ideas have been rejected by mainstream academia (often vociferously so) and his work is generally regarded as erroneous in all its detailed conclusions. Moreover, scholars view his unorthodox methodology (for example, using comparative mythology to derive scenarios in celestial mechanics) as an unacceptable way to arrive at conclusions. Stephen Jay Gould offered a synopsis of the mainstream response to Velikovsky, writing, "Velikovsky is neither crank nor charlatan—although, to state my opinion and to quote one of my colleagues, he is at least gloriously wrong ... Velikovsky would rebuild the science of celestial mechanics to save the literal accuracy of ancient legends." Velikovsky's bestselling, and as a consequence most criticized, book is Worlds in Collision. Astronomer Harlow Shapley, along with others such as Cecilia Payne-Gaposchkin, were highly critical of Macmillan's decision to publish the work. The fundamental criticism against this book from the astronomy community was that its celestial mechanics were physically impossible, requiring planetary orbits that do not conform with the laws of conservation of energy and conservation of angular momentum. Velikovsky relates in his book Stargazers & Gravediggers how he tried to protect himself from criticism of his celestial mechanics by removing the original appendix on the subject from Worlds in Collision, hoping that the merit of his ideas would be evaluated on the basis of his comparative mythology and use of literary sources alone. However, this strategy did not protect him: the appendix was an expanded version of the Cosmos Without Gravitation monograph, which he had already distributed to Shapley and others in the late 1940s—and they had regarded the physics within it as absurd. It was not until the 1980s that a very detailed critique of Worlds in Collision was made in terms of its use of mythical and literary sources when Bob Forrest published a highly critical examination of them (see below). Earlier in 1974, James Fitton published a brief critique of Velikovsky's interpretation of myth (ignored by Velikovsky and his defenders) whose indictment began: "In at least three important ways Velikovsky's use of mythology is unsound. The first of these is his proclivity to treat all myths as having independent value; the second is the tendency to treat only such material as is consistent with his thesis; and the third is his very unsystematic method." A short analysis of the position of arguments in the late 20th century is given by Dr Velikovsky's ex-associate, and Kronos editor, C. Leroy Ellenberger, in his A Lesson from Velikovsky. More recently, the absence of supporting material in ice-core studies (such as the Greenland Dye-3 and Vostok cores) has removed any basis for the proposition of a global catastrophe of the proposed dimension within the later Holocene period. However, tree-ring expert Mike Baillie would give credit to Velikovsky after disallowing the impossible aspects of Worlds in Collision: "However, I would not disagree with all aspects of Velikovsky's work. Velikovsky was almost certainly correct in his assertion that ancient texts hold clues to catastrophic events in the relatively recent past, within the span of human civilization, which involve the effects of comets, meteorites and cometary dust ... But fundamentally, Velikovsky did not understand anything about comets ... He did not know about the hazard posed by relatively small objects ... This failure to recognize the power of comets and asteroids means that it is reasonable to go back to Velikovsky and delete all the physically impossible text about Venus and Mars passing close to the earth ... In other words, we can get down to his main thesis, which is that the Earth experienced dramatic events from heavenly bodies particularly in the second millennium BC." Velikovsky's revised chronology has been rejected by nearly all mainstream historians and Egyptologists. It was claimed, starting with early reviewers, that Velikovsky's usage of material for proof is often very selective. In 1965 the leading cuneiformist Abraham Sachs, in a forum at Brown University, discredited Velikovsky's use of Mesopotamian cuneiform sources. Velikovsky was never able to refute Sachs' attack. In 1978, following the much-postponed publication of further volumes in Velikovsky's Ages in Chaos series, the United Kingdom-based Society for Interdisciplinary Studies organised a conference in Glasgow specifically to debate the revised chronology. The ultimate conclusion of this work, by scholars including Peter James, John Bimson, Geoffrey Gammonn, and David Rohl, was that the Revised Chronology was untenable. The SIS has continued to publish updates of this ongoing discussion, in particular the work of historian Emmet Sweeney. While James credits Velikovsky with "point[ing] the way to a solution by challenging Egyptian chronology", he severely criticised the contents of Velikovsky's chronology as "disastrously extreme", producing "a rash of new problems far more severe than those it hoped to solve" and claiming that "Velikovsky understood little of archaeology and nothing of stratigraphy." Bauer accuses Velikovsky of dogmatically asserting interpretations which are at best possible, and gives several examples from Ages in Chaos. Such was the hostility directed against Velikovsky from some quarters (particularly the original campaign led by Harlow Shapley), that some commentators have made an analysis of the conflict itself. Among these was a study by American Behavioral Scientist magazine, eventually published in book form as The Velikovsky Affair — Scientism Versus Science. This framed the discussion in terms of how academic disciplines reacted to ideas from workers from outside their field, claiming that there was an academic aversion to permitting people to cross inter-disciplinary boundaries. More recently, James Gilbert, professor of history at the University of Maryland, challenged this traditional version with an account that focused on the intellectual rivalry between Velikovsky's ally Horace Kallen and Harlow Shapley. Earlier, Henry Bauer had challenged the view that the Velikovsky Affair illustrated the resistance of scientists to new ideas by pointing out "the nature and validity of Velikovsky's claims must be considered before one decides that the Affair can illuminate the reception of new ideas in science ..." and, on the same basis, Keith Dixon contended that the treatment of the case by sociologists was an example of a broader unhealthy tendency in sociology to explain all opinions as ideologically motivated without considering their possible rational basis. The scientific press, in general, denied Velikovsky a forum to rebut his critics. Velikovsky claimed that this made him a "suppressed genius", and he likened himself to the 16th century heretical friar Giordano Bruno, who was burnt at the stake for his beliefs. The controversy created by Velikovsky's publications may have helped revive the catastrophist movement in the second half of the 20th century; however, it is also held by some working in the field that progress has actually been retarded by the negative aspects of the so-called Velikovsky Affair. ^ Gordin, Michael D. (2012). The Pseudoscience Wars: Immanuel Velikovsky and the Birth of the Modern Fringe. Chicago, London: University of Chicago Press. ISBN 0-226-30442-6. ^ "Johann Gottlieb Radlof — The Velikovsky Encyclopedia". Velikovsky.info. Retrieved 2010-06-03. ^ Clube, S. V. M. and Bill Napier 1984. Velikovskians In Collision. Quadrant (Sydney). Jan.-Feb., pp. 33–34; reprinted in Kronos vol. IX, no. 3, 1984. pp. 44–49. ^ Trevor Palmer, Perilous Planet Earth: Catastrophes and Catastrophism through the Ages, Cambridge University Press, ISBN 0-521-81928-8. pp. 116–119. ^ Morrison, David (2001). Velikovsky at Fifty: Cultures in Collision on the Fringes of Science. Skeptic, 9 (1), 62–76; reprinted in Shermer, Michael (editor) (2002). The Skeptic Encyclopedia of Pseudoscience, Santa Barbara, Calif. ISBN 1-57607-653-9. 473–488. ^ Cohen, Daniel (1967). Myths of the Space Age, Dodd Mead. LCCN 67-25108. Chap. VIII, Immanuel Velikovsky — the Man Who Challenged the World, pp. 172–94. ^ Gordon, Theodore J. (1966). Ideas in Conflict, St. Martin's Press. LCCN 66-23261. Chap. 2, The Miracles of Exodus, pp. 18–48. ^ Fair, Charles (1974). The New Nonsense: The End of the Rational Consensus, Simon and Schuster. ISBN 0-671-21822-0. Chap. viii, Speaking of Flying Objects ..., pp. 139–86. ^ Bauer, Henry H. (1992). The Velikovsky Affair Aeon, 2 (6), 75–84. Homestead.com This article, a comprehensive overview, originally appeared in Dec. 1988 La Recherche, pp. 1448–55. ^ Bauer, Henry H. (1996). Velikovsky, Immanuel, in Gordon Stein (editor), The Encyclopedia of the Paranormal. Prometheus Books. ISBN 1-57392-021-5. pp. 781–788. ^ Grove, J. W. (1989). In Defence of Science: Science, technology, and politics in modern society, University of Toronto Press. ISBN 0-8020-2634-6. Chap. 5, Pseudo-science, pp. 120–50; adapted from Grove, J. W. (1985). Rationality at Risk: Science against Pseudoscience. Minerva, 23 (2), 216-40. ^ Velikovsky, Immanuel (1983). Stargazers and Gravediggers, William Morrow & Co. ISBN 0-688-01545-X. p. 63. ^ Vorhees, Duane (1996). Aeon, 4 (2), 107-11. ^ Moore, Brian (1997). Chronology & Catastrophism Review 1997 (2), 51. ^ Velikovsky, Immanuel (1942). Affidavit, November 23. ^ Vorhees, Duane. (1990). The "Jewish Science" of Immanuel Velikovsky: Culture and Biography as Ideational Determinants. Dissertation, Bowling Green State University. ^ Velikovsky, Immanuel 1983. Stargazers and Gravediggers. William Morrow and Co. ISBN 0-688-01545-X. Footnote, p. 165, indicates no retreat and states "Gravitation is an electromagnetic phenomenon." ^ Bauer, Henry H. 1984. Beyond Velikovsky: The History of a Public Controversy. University of Illinois Press. ISBN 0-252-01104-X. p. 233. ^ Ellenberger, C. Leroy 1985. sec. "Electric Stars" in "Still Facing Many Problems (Part II)", Kronos X (3), pp. 15–23. ^ Thompson, Tim 2001. "On the 'Electric Sun' Hypothesis". Thompson is a physicist retired from the Jet Propulsion Laboratory. ^ Bridgman, W. T. 2008. "The Electric Sky, Short-Circuited" Archived 2009-09-19 at the Wayback Machine. Bridgman is an astrophysicist at NASA-Goddard Spaceflight Center in Greenbelt, Maryland. ^ Bauer, Henry H. (1985), "Inside the Velikovsky Affair" (PDF), Skeptical Inquirer, 9 (3): 284–288. ^ Sagan, Carl (1977). An Analysis of Worlds in Collision, in Goldsmith, Donald (editor) (1977). Scientists Confront Velikovsky. Cornell University Press. ISBN 0-8014-0961-6. pp. 41–104. ^ Here is an example of the reworking of the text between 1977 and 1979: "My own position is that even if twenty percent of the legendary concordances which Velikovsky produces are real, there is something important to be explained ... Likewise, we should not be surprised if a few elements of a few legends are coincidentally identical. But I do not believe that all of the concordances which Velikovsky produces can be explained away in this manner" (1977, pp. 48–50), compared with "My own position is that if even 20 percent of the legendary concordances that Velikovsky produces are real, there is something important to be explained ... Likewise, we should not be surprised if a few elements of a few legends are coincidentally identical. But I believe that all of the concordances Velikovsky produces can be explained away in this manner" (1979, pp. 86–88). ^ Baillie, Mike (1999). Exodus to Arthur: Catastrophic Encounters with Comets, B.T. Batsford Ltd.; London. ISBN 0-7134-8352-0. Chap. 12, Velikovsky Revisited, pp. 166–180 (170–172). ^ Albright, William 1952. New York Herald Tribune Book Review April 20. Retelling the Near East's Ancient History. p. 6. ^ Kaempffert, Waldemar, "Solomon, the Queen of Sheba, and the Egypt of Exodus" (abstract with subscriber access to full PDF), New York Times Book Review p. 23, April 20, 1952. Digital link retrieved 2015-07-18. ^ Stiebing, Jr., William H. 1984. Cosmic Catastrophism, Chap. III, in Ancient Astronauts, Cosmic Collisions Prometheus Books. ISBN 0-87975-260-2. pp. 57–80. ^ Transcript in Aeon 1992, Vol.3 No.1, pp. 103–5. Also "Address of Abraham Sachs at Brown University, 3/15/65"; provided by Leroy Ellenberger via abob.libs.uga.edu. Retrieved 2016-03-05. ^ Ellenberger, Leroy 1992. Aeon 3 (1), section "Bonanza from Brown" in "Of Lessons, Legacies, and Litmus Tests: A Velikovsky Potpourri (Part One)", pp. 88–90. "Velikovsky confronted a panel of four professors [at Brown University on March 15, 1965]: Leon N. Cooper (physics), Bruno J Giletti (geology), Charles Smiley (astronomy) and Abraham J. Sachs (history of mathematics) [who was substituting for Otto Neugebauer ], moderated by Henry Kučera (linguistics). In the event, Velikovsky debated the first three handily. He was stunned by Sachs whose address was both a rhetorical and substantive tour de force. Velikovsky's rebuttal began: 'Dr. Sachs threw so many accusations in that Philippic of his that I am at a difficulty to answer; but I invite Dr. Sachs to spend the hour and a half tomorrow at the meeting [at Diman House], and every one of you too, and point by point each of his statements will be proven wrong.' Unfortunately, Sachs did not show up the next day and Velikovsky did not even mention Sachs [according to the tape recording of the proceedings in the possession of Warner B. Sizemore who loaned it to Ellenberger March 31, 1979]. Curiously, Velikovsky's file for the Brown trip contains typed rebuttals to all the panelists except Sachs, for whom only partial, penciled notes exist—but later that year Velikovsky would reply to Kim J. Masters, a Princeton sophomore, within a week in The Daily Princetonian (Nov. 15, 1965) over a criticism of Oedipus and Akhnaton. Velikovsky's rebuttal to Masters was scathing, running the gamut from haggling over details to ad hominems. ^ For example: "Chronology and Catastrophism Review (C&CR)" back issues (Jan 1976–2015); "Ages Still in Chaos" (13–15 Sep 2002); "A couple of sites on a revised chronology" (4 Sep 2010); found via an 'Emmet Sweeney' search at Society for Interdisciplinary Studies website; this is just a sampling of Velikovsky (and Sweeney) links there. Retrieved 2016-03-05. ^ Gilbert, James (1997). Redeeming Culture: American Religion in an Age of Science, University of Chicago Press. ISBN 0-226-29320-3. Chap. 8, Two Men of Science, pp. 170–97. ^ Steel, Duncan (1995). Rogue Asteroids and Doomsday Comets, John Wiley & Sons. ISBN 0-471-30824-2. p. 155. ^ Morrison, David (2001). Velikovsky at Fifty: Cultures in Collision on the Fringes of Science. Skeptic, 9 (1), 62–76; reprinted in Shermer, Michael (editor) (2002). The Skeptic Encyclopedia of Pseudoscience, Santa Barbara, Calif. ISBN 1-57607-653-9. 473–488. Morrison quotes several scientists who embrace the latter view, including Walter Alvarez, David Raup, Richard Muller, Jay Melosh, Peter Ward, and Don Yeomans. This survey confirms the hunch expressed by Morrison and Clark R. Chapman[clarification needed] in Chapter 13 "Catastrophism Gone Wild: The Case of Immanuel Velikovsky" in Cosmic Catastrophes (1989), pp. 183–96. Abell, George O. (1981). Scientists and Velikovsky, in Paranormal Borderlands of Science, edited by Kendrick Frazier, Prometheus Books. Bauer, Henry H. (1980). Passions and Purposes: A Perspective, Skeptical Inquirer, Vol 5, #1, Fall 1980, 28–31. Reprinted in Paranormal Borderlands of Science, edited by Kendrick Frazier, Prometheus Books. Bauer, Henry H. (1984, paperback ed. 1999). Beyond Velikovsky. The History of a Public Controversy. University of Illinois, Urbana. Carroll, Robert Todd (2003). The Skeptic's Dictionary: A Collection of Strange Beliefs, Amusing Deceptions, and Dangerous Delusions, John Wiley & Sons, ISBN 0-471-27242-6. Pages 396–401. Alfred de Grazia, Ralph E. Juergens, Stecchini L.C. (Eds.) (1978). The Velikovsky Affair — Scientism versus Science. 2ed., Metron Publications, Princeton, New Jersey. Also online. Dolby, R. G. A. (1975). What Can We Usefully Learn from the Velikovsky Affair. Social Studies of Science 5, 165-75; revised as On Schools of Thought, S.I.S. Review 1976; I(3), 26–30. Forrest, Bob (1981). Velikovsky's Sources. In six volumes, with Notes and Index Volume. Privately published by the author, Manchester. Forrest, Robert (1983). Venus and Velikovsky: The Original Sources, Skeptical Inquirer, Vol 8, #2, Winter 1983–1984, 154–164. Forrest, Bob (1987). Guide to Velikovsky's Sources. Stonehenge Viewpoint, Santa Barbara. Frazier, Kendrick (1980). The Distortions Continue, Skeptical Inquirer, Vol 5, #1, Fall 1980, 32–38. Reprinted in Paranormal Borderlands of Science, edited by Kendrick Frazier, Prometheus Books. Ginenthal, Charles (1996). Stephen Jay Gould and Immanuel Velikovsky, Ivy Press Books. Goldsmith, Donald, (Ed.) (1977) Scientists Confront Velikovsky. Norton. Proceedings of a symposium at the 1974 meeting of the American Association for the Advancement of Science. Gordin, Michael D. (2012). The Pseudoscience Wars: Immanuel Velikovsky and the Birth of the Modern Fringe. Chicago, London: University of Chicago Press. ISBN 0-226-30442-6. Marriott, David (2004) The Velikovsky Inheritance, Vanguard Press, 2006, ISBN 1-84386-121-6, ISBN 978-1-84386-121-8. Oberg, James (1980). Ideas in Collision, Skeptical Inquirer, Vol 5, #1, Fall 1980, 20–27. Reprinted in Paranormal Borderlands of Science, edited by Kendrick Frazier, Prometheus Books. Payne-Gaposchkin, Cecilia (1952). Worlds in Collision, in Proceedings of the American Philosophical Society, vol 96, Oct. 15, 1952. Pensée. 1972–1975. Immanuel Velikovsky Reconsidered. I – X. Student Academic Freedon Forum, Portland. Plait, Philip (2002). Bad Astronomy: Misconceptions and Misuses Revealed, from Astrology to the Moon Landing "Hoax", John Wiley & Sons, ISBN 0-471-40976-6. Chapter 18. Sagan, Carl, (1979) Broca's Brain. Random House. Reissued 1986 by Ballantine Books. ISBN 0-345-33689-5. Reprinted as chapter 15 of Science and the Paranormal: Probing the Existence of the Supernatural, edited by George O. Abell and Barry Singer, Scribners, 1981. Chapter 7 in Broca's Brain, "Venus and Dr. Velikovsky", is a corrected and slightly revised version of "An Analysis of Worlds in Collision," which originally appeared in Scientists Confront Velikovsky. This page is based on the Wikipedia article Immanuel Velikovsky; it is used under the Creative Commons Attribution-ShareAlike 3.0 Unported License (CC-BY-SA). You may redistribute it, verbatim or modified, providing that you comply with the terms of the CC-BY-SA.